While streaming, you can still text or call without interrupting what's playing or draining your battery. 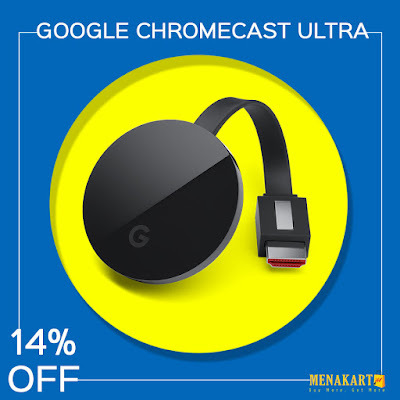 Even without a 4K TV, Chromecast Ultra delivers better picture quality for your TV. Use your mobile device as a remote. Stream your favorite TV shows, movies and more to the TV using your mobile phone. Watch 4K-enabled content from YouTube and Netflix and discover more at chromecast site. Get faster load times and smoother streaming. Comes with a built in optional Ethernet adapter for slow Wi-Fi connections. Web-based services and content require high-speed Internet service. Some services may require subscription. *To view content in 4K or HDR, a 4K- or HDR-capable TV and reliable broadband internet connection are also required. Minimum OS and broadband requirements are at google site.